Traditional pasta extruders, as mesmerizing as they are, can only handle so much complex geometry. Barilla recently held a competition for 3D-printed pasta shapes, and the winners include unusual shapes like a blooming rose and cratered moon. 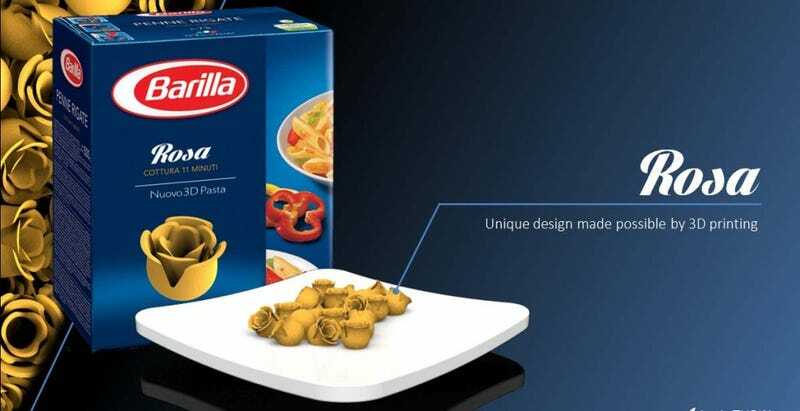 As the largest pasta maker in the world, Barilla has recently dropped hints about wanting to make its own 3D-printed pasta. Imagine, a scientist on the project told the Guardian, dozens of pasta shapes available at your fingertips with a USB stick and a cartridge of dough. But what will 3D-printed pasta look like? To explore the possibilities of 3D-printed pasta geometry, Barilla sponsored a contest. The recently announced winners include Rosa, a rose -shaped pasta that will bloom like a flower as it is cooked, shown above. Rosa is designed by Loris Tupin of Maxilly sur Léman, France. A second winner was Vortipa, by Danilo Spiga and Luis Fraguarda of Caliga, Italy, which looks like an edible woven vortex. Last but not least is Lune from Alessandro Carabini of Paris, France, modeled after a full moon with craters. The hollow ball is supposed to help hold sauces in the pasta.